The other day I came across a fellow blogger (DailySnaps2012) who had shared some nice star trail photos she had taken last week. Star trails and night photography are some of my all-time favorite shots to try and capture, so I thought I would share two that I took during a Father-Son campout last fall. My favorite ones are of the North Star, because it is a constant in the night sky, but all the other stars rotate around it to create a sort of vortex look. In order to get a cooler effect, leave the shutter open for a longer time – the longer, the better. The night I took these photos, there was a full moon, so I wasn’t sure how long I could keep the shutter open without over-exposing the whole thing. I think this was about 5-10 minutes, but again, I don’t remember. However, I do like how the moon lit up the tree, I just wish the stars showed up a little better. I then pointed the camera south to get some longer star trails. Not only did I like how the tall evergreen shoots up and out of the dark hill side and into the sky, the clouds moving through the sky added a nice look to the photo. 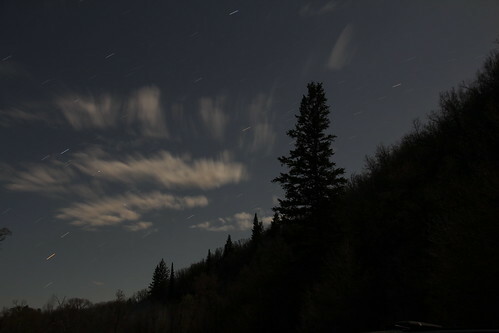 Although the full moon was lighting up the sky, the city lights from around Pineview Reservoir polluted the lower portion of the photo, but gave a nice gradient effect to the night sky. Getting up and into the mountains offer the best setting for photographing star trails – away from the light pollution of nearby cities. But getting up into the mountains isn’t something that I can do on a whim, but it is something that I would love to do more often. If I do get out and capture some interesting star trails, I will definitely share. 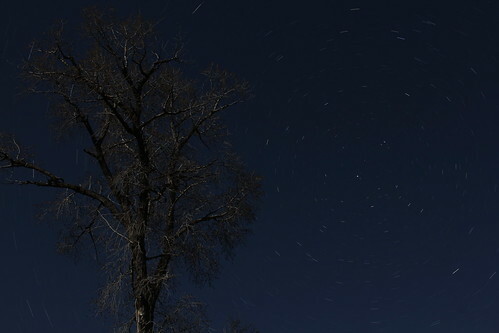 Thanks again to Lisa from DailySnaps2012 for sharing her star trail photos. Thanks, and you’re welcome. I enjoy checking out your photos, as they are creative and make me think of different ways I can take photos to stretch my thinking.